With effect from this past summer term, Aiglon has been pleased to make internal appointments to several newly created positions as part of an extended leadership team. The position of Senior Tutor has been taken on by Esmond Tweedie, Assistant Deputy Head (Student Life) by Brian Martineau and Assistant Deputy Head (Curriculum) by Tom Duckling. The creation of these positions will allow the School to continue developing its offerings in welfare, academics, activities and international trips. After almost a term on the job, we asked each of these new appointees what they had been busy working on, and how they hoped their position could strengthen Aiglon’s programmes. Tell us about these new posts. What have your new responsibilities included? Mr Tweedie -- Senior Tutor: In addition to my current role as IB Coordinator, as Senior Tutor I will focus on reforming our tutoring programmes. This includes reviewing prep time, changes to house and sports colours, the sanctions and rewards processes, extending leadership opportunities, managing prefects and discipline across the school. 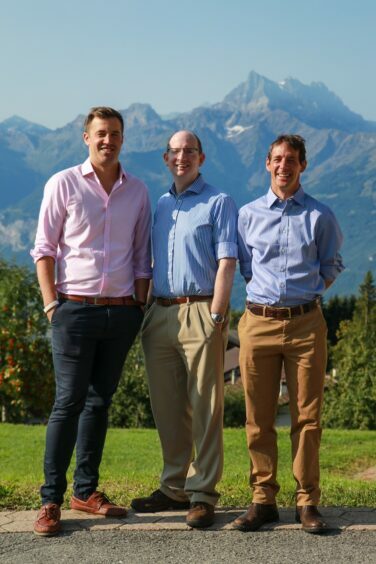 Mr Martineau -- Assistant Deputy Head (Student Life): I will be overseeing Aiglon’s activities and co-curricular programme. This includes managing educational visits, managing all local and global international trips and visits as well as assisting the Deputy Head (Student Life) with the school calendar and managing the staffing of weekends and activities. Mr Duckling -- Assistant Deputy Head (Curriculum): My focus will be on what happens in the classroom and what we can do to make lessons even more fun and engaging. We want to foster a spirit of enquiry, provide continual intellectual challenge and ensure students leave Aiglon with a genuine love of learning. Most of all I plan to get out and see students in as many lessons as possible and support staff in developing their practice by providing tailored professional development. How will your roles help to support the students at Aiglon? Mr Tweedie: The aim is to support students by building on how Aiglon develops guiding and coaching relationships between students and staff, ideally through the same coaching methods as staff are developed. We are keen to promote student action and responsibility so that students are empowered to take control of change and innovation at Aiglon. Mr Martineau: Deciding to remove Saturday lessons opens up lots of opportunities for trips around Europe and other co-curricular events, as students will now have a larger weekend block. This is part of our plan to open up some space for students and enable them to do all the things that make them ‘Aiglonians’ alongside their academics. Mr Duckling: As someone who believes in the very corny idea of education being the most likely way to change the world, I want to support them by providing the most aspirational and inspirational environment possible, both inside and outside of the classroom. And then they can change the world for us. What are you most excited for as you develop in this post? Mr Tweedie: Reforms in the tutoring programme will create opportunities for us to engage in a coherent manner, with a focus on strengthening relationships across the school. This is an exciting opportunity that can benefit everyone. Mr Martineau: The work in these new roles is a chance for us to celebrate what Aiglon does best and reflect on areas in which we can improve the lives and experiences of students and staff. Mr Duckling: We have set up a Teaching and Learning Group that is focused on making Aiglon one of the best schools in the world. We want to be progressive in the classroom, but at the same time, we are basing everything we do around the foundational guiding principles of the school to support our traditional focus on holistic and moral education. What new initiatives have you been looking at since taking this post? Mr Tweedie: A key opportunity with these developments will be the individualisation of tutorial relationships so that staff are given time to identify, explain and explore with tutees precisely what is relevant to that specific student as they move through the school year. Mr Martineau: The change to the weekend schedules opens up a wealth of opportunities for staff and students. Trips that go a little further away, engaging in more sporting fixtures - and being able to run full rehearsal weekends for our renowned theatrical productions mean students and staff have even more options to take advantage of all that Aiglon offers. Mr Duckling: The first thing we are doing is changing our appraisal system to focus directly on the guiding professional development based on a coaching model. We aim to inspire our already fantastic staff to push themselves as educators and develop their skills. Another early change is we are bringing in a new merits system to reward the students in their daily and weekly achievements.